How to find the volume in a different unit? 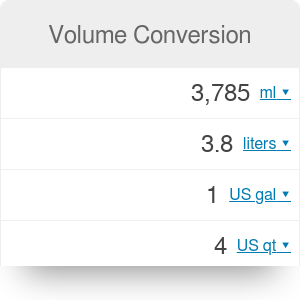 The volume conversion tool makes converting between the volume units easy. We automatically display the result in eight most popular units, but if you need more, click on the unit name to browse through 21 variants. Have you ever wondered how many cups in a pint are? Or you need to calculate the tablespoons in a cup or change pints to the quarts? Volume converter can do it for you in real time. Don't forget to check other great tools in our collection, such as weight or length converter. If you need the converter for changing weight to volume in the recipe - use these grams to cups or density calculators. There are many other volume conversion charts and tables available on the web, but thanks to that calculator you don't need it anymore. Let's imagine that you want to bake a cake, but the problem is that the recipe comes from different part of the world. You are used to your standard units, such as cups or pints, but you have no idea how much is 550 ml of milk. What can you do? Put that value in the calculator next to milliliters unit, and immediately you will get the answer in cups (2.32), pints (1.16) or even teaspoons (110) if you wish. Volume Conversion can be embedded on your website to enrich the content you wrote and make it easier for your visitors to understand your message.